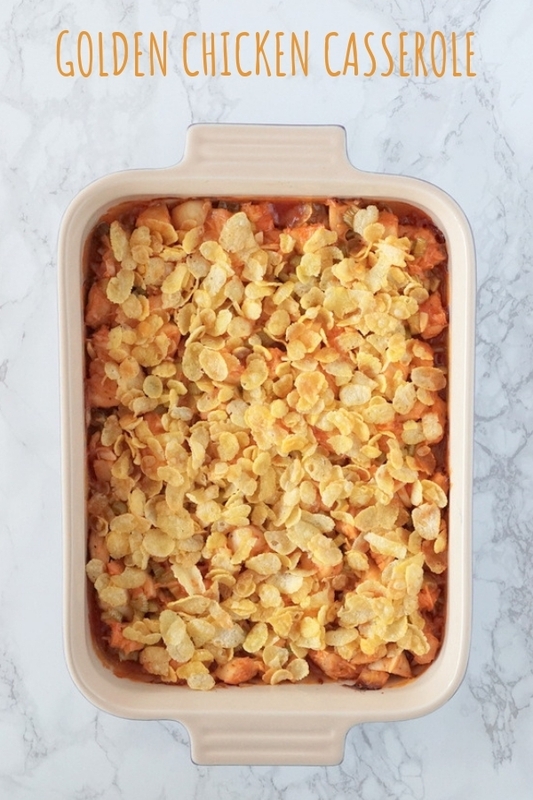 Try this easy, cheesy, tangy, crunchy casserole with a golden corn flake topping! 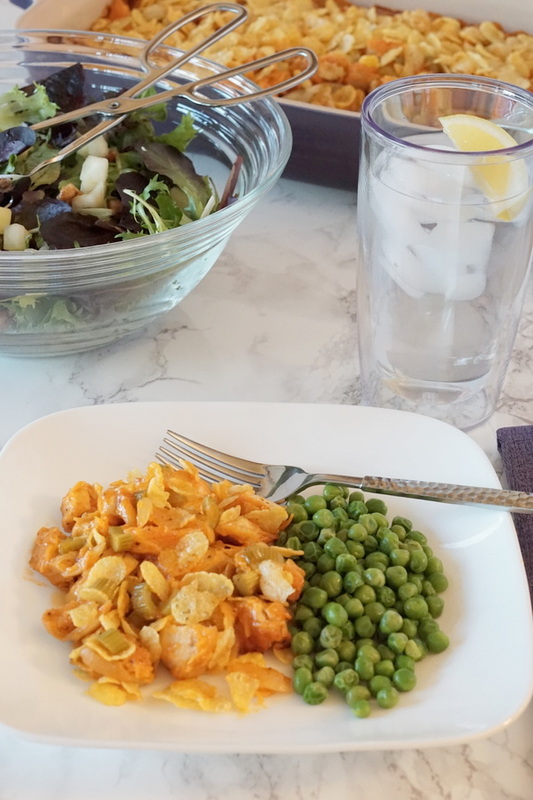 Make it a meal with peas, a salad, plus a bonus dessert. This simple and delicious Golden Chicken Casserole has been in my “family cookbook” for as long as I can remember! Over the years it has held up as a favorite meal that I actually enjoy making… and I make it at least every other month. The only problem… I never have any leftovers! 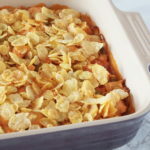 This yummy casserole should be able to feed at least 6 people, however, my family of 4 usually devours it at one sitting! I make this casserole so frequently because it really is easy (a requirement for my kitchen endeavors). Of course, it’s also very tasty (another requirement). 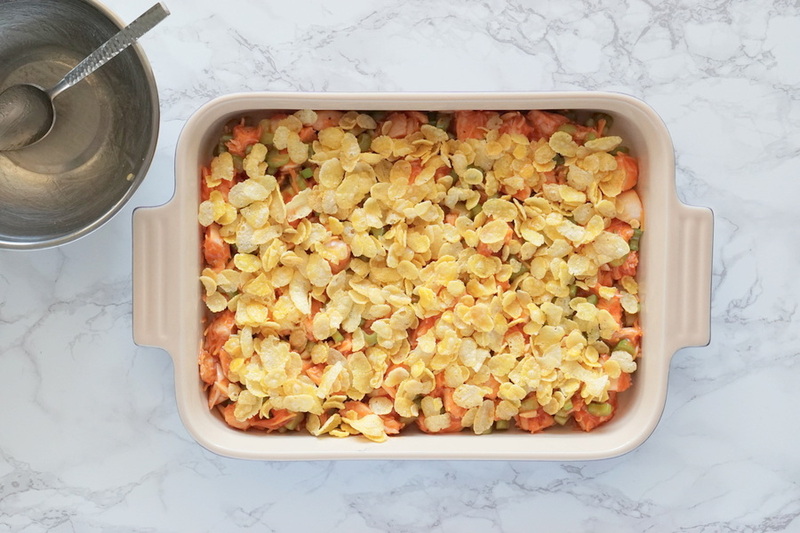 And unlike other casseroles that can be loaded with lots of calories, the ingredients in this casserole are light and healthy. 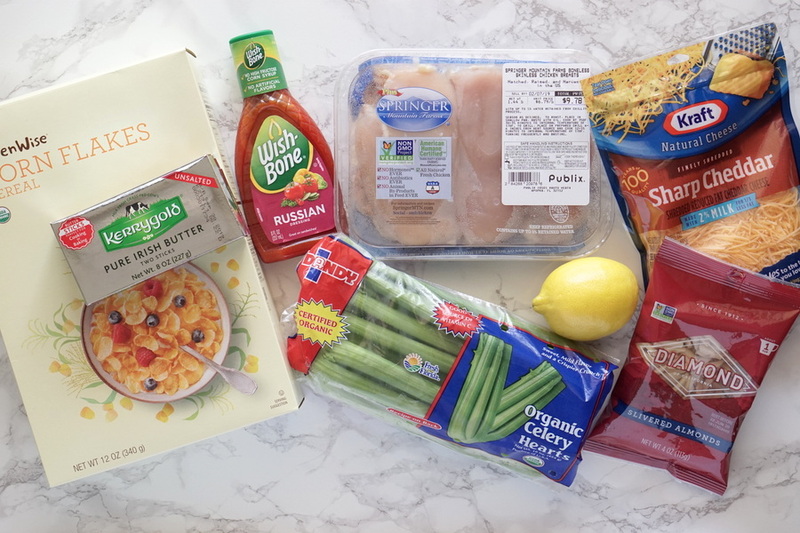 There are only 6 simple ingredients for the main part of the casserole: chicken breasts, celery, cheddar cheese, slivered almonds, lemon juice, and Russian salad dressing. This is the only time I buy Russian dressing. It’s the key to the tangy flavor in this casserole! 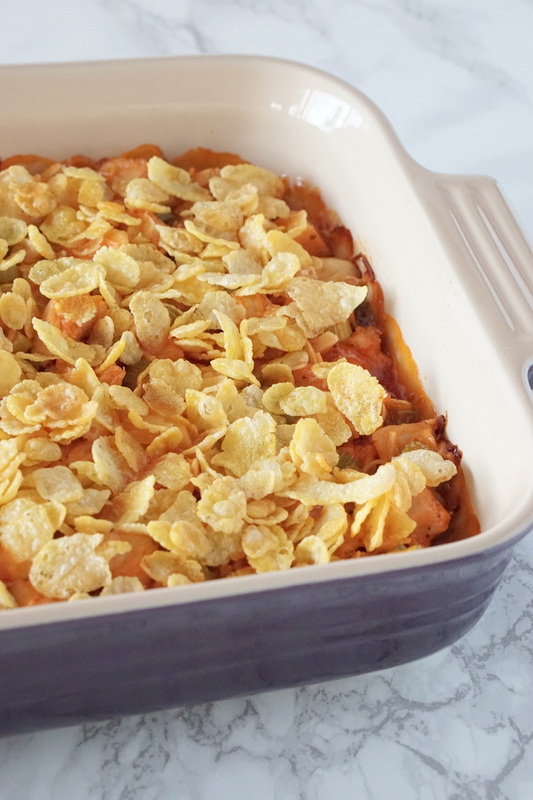 Another key ingredient that adds crunch and character to this casserole is Corn Flakes cereal. Combined with some melted butter, the corn flakes create a fun topping. Kids will especially love it. Cereal on chicken? That should intrigue them! 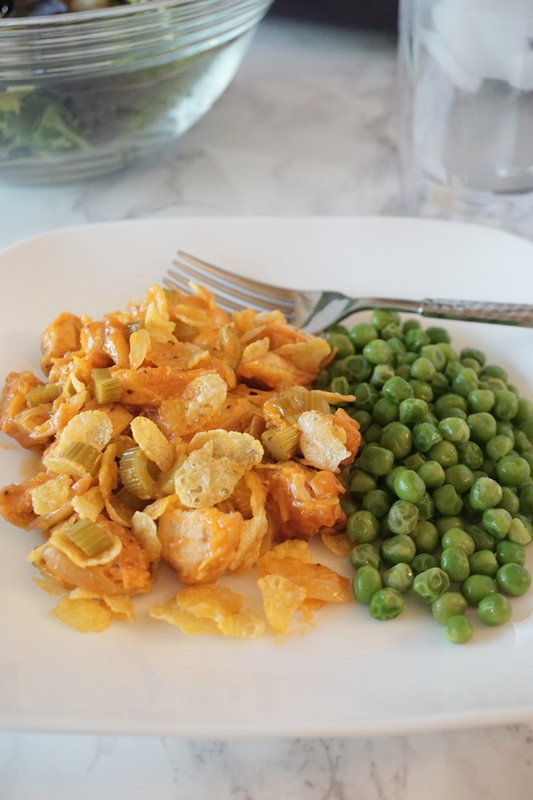 Of course, you could always make the casserole without the cornflake topping if you prefer. Once you have all the ingredients the prep is super easy! You can complete most of the prep ahead of time, assemble the casserole, refrigerate, and then bake it right before you’re ready to eat. To cook chicken breasts, I generally just throw them on a baking pan lined with tinfoil and bake at 375 F for 20-25 minutes. Completing this step ahead of time will save you time later on. 4. Mix corn flakes with melted butter and sprinkle over casserole. *If you prepare the casserole ahead of time, wait and add the corn flake topping just before baking. While the casserole is baking you have plenty of time to prepare a couple of sides. 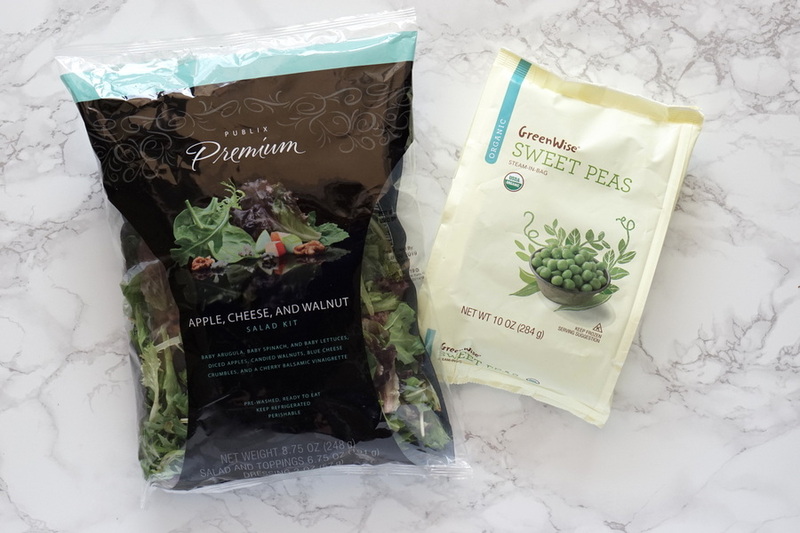 I steamed some peas in the microwave, but feel free to choose any vegetable you prefer. A simple salad is a nice accompainment as well. I chose a salad kit from my local grocery store but you could also create a version yourself. The salad kit included Baby Arugula, Baby Spinach, Baby Lettuces, Diced Apples, Candied Walnuts, Blue Cheese Crumbles, and a Balsamic Vinaigrette. I saved the Blue Cheese for another day and substituted raw walnuts for the candied walnuts. Since my kids are still not the best “salad eaters”, I sliced up an apple for them. 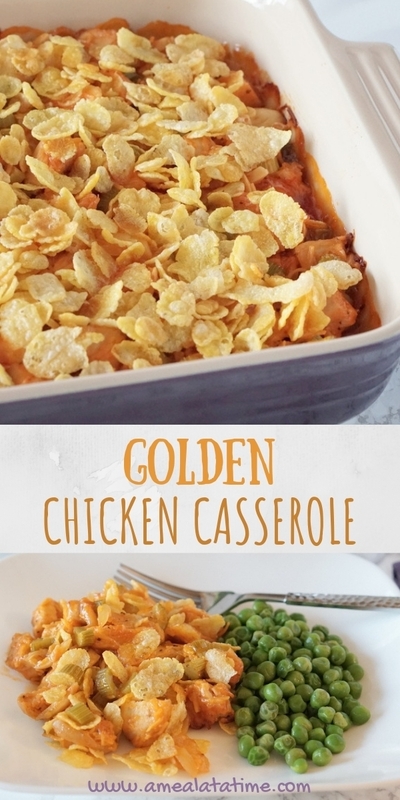 This Golden Chicken Casserole is a unique and yummy way to enjoy poultry. There’s no heavy sauce or high-calorie ingredients and you can add lots of veggies on the side. Feel good about serving this meal over and over again! A perfect make-ahead meal for your family and ideal for a potluck. Just don’t count on too many leftovers because it will be a hit! If you’re lucky enough to have leftovers, it makes an awesome lunch the next day! I love dessert! It’s a simple joy in life that I’m just not willing to give up! However, I’m really not much of a baker. So, I rely on quality short-cuts to keep our desserts quick and easy. 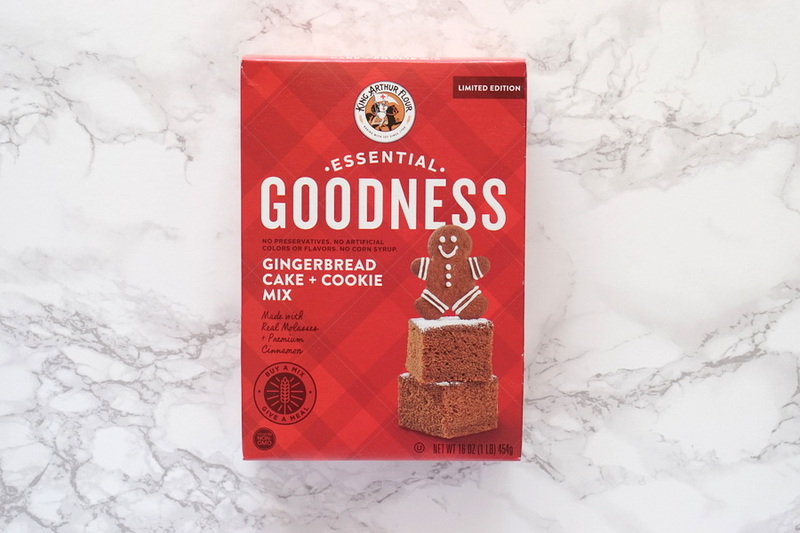 This Gingerbread Cake Mix (affiliate link) from King Arthur Flour is right up my alley! The mix contains real ingredients with no added junk. Just add water, 1 egg and oil (I used avocado oil, but you could also use applesauce) and bake for 30 minutes. I prefer my slice warm with a dollop of whipped cream. Yum! Try making this simple cake in the Fall or Winter. Use a quality chocolate cake mix for dessert in the Spring and Summer. 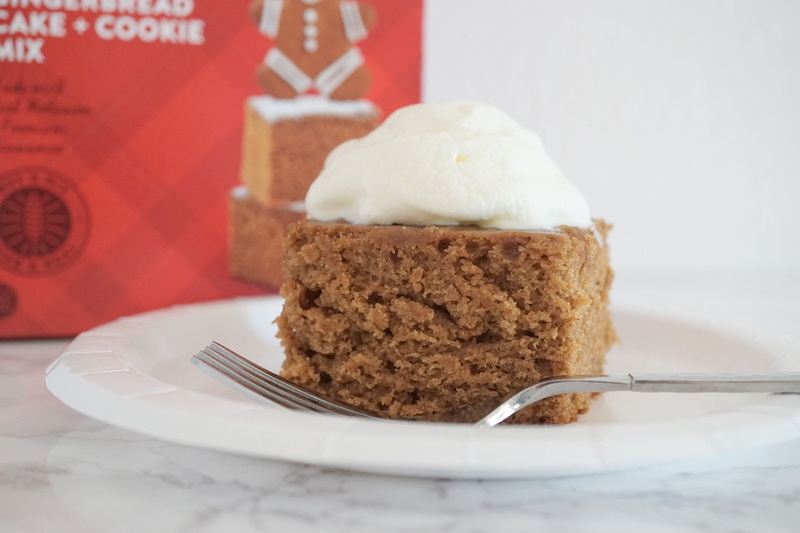 Skip the frosting and top with whipped cream! 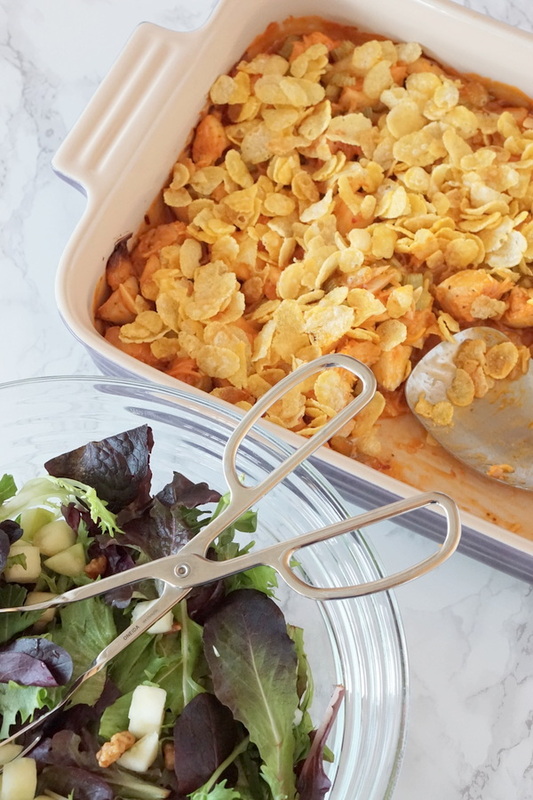 This cheesy, tangy, crunchy casserole is topped with golden corn flakes and comes together easily! Make it a meal with a side of veggies and a salad. Prep ahead: Cook chicken breasts for about 20-25 minutes (or until no longer pink) in a 375 F oven. 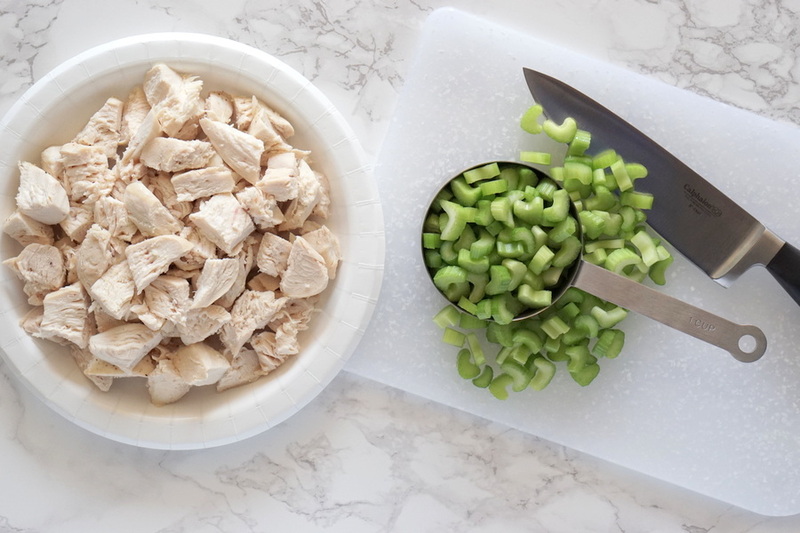 Chop chicken into bite-size pieces. Chop celery. 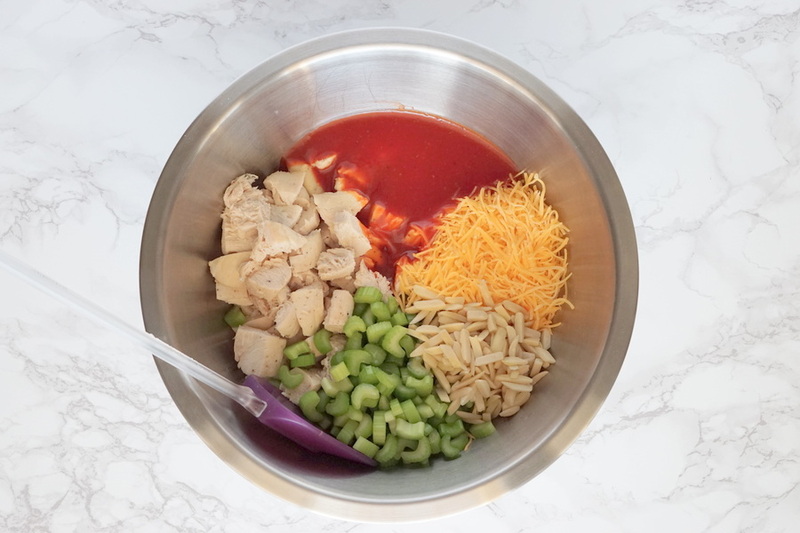 Pre-heat oven to 325 F. In a large bowl, combine cooked chopped chicken, chopped celery, shredded cheese, slivered almonds, Russian dressing and lemon juice. 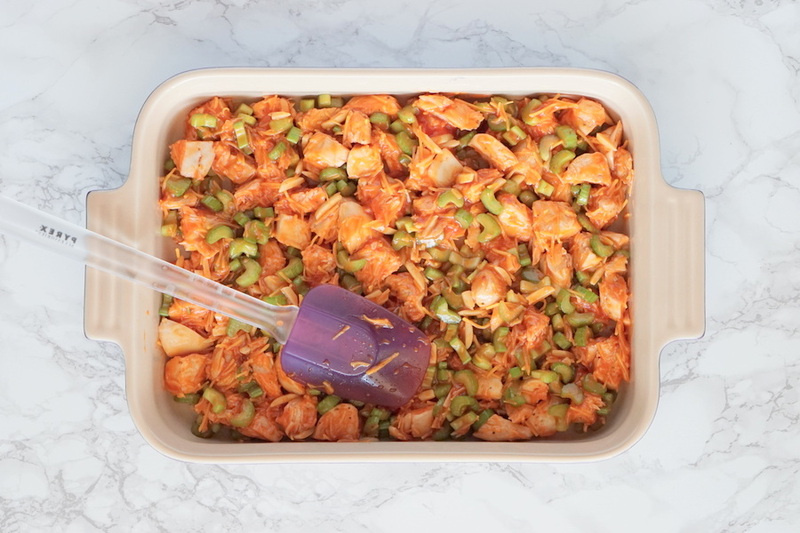 Spoon mixture into a 13×9 baking dish. In a small bowl, combine corn flakes with melted butter. Sprinkle cornflake topping evenly over the chicken mixture. Bake at 325 F for 35 minutes. *Make Ahead: Complete the first 2 steps, cover and refrigerate. Top casserole with corn flake topping just before ready to bake. *On The Side: Serve with a vegetable, such as peas. Also serve with a salad of mixed greens, diced apple, chopped walnuts and Balsamic Vinaigrette. *Dessert Idea: Gingerbread or Chocolate cake with whipped cream topping.